"CRISPR/Cas9 Endogenous Tagging of NPC1 in HEK293t and human iPSCs" by Stephanie Valencia, John W. Steele et al. 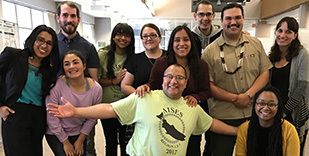 Niemann Pick Disease Type C1 (NPC1) is a rare lysosomal storage disorder that affects 1:150,000 people. The disease is characterized by cholesterol accumulation within lysosomes, as well as clinical cognitive decline and neurodegeneration. These symptoms are associated with mutations in the NPC1 gene that leads to disruption of intracellular cholesterol transport. Our previous studies indicate that neurons from NPC1 patient iPSCs or the NPC1 I1061T mouse model display impaired turnover of damaged mitochondria. We hypothesized that the accumulation of damaged mitochondria in neurons results in premature neuronal death, driving neurodegeneration in NPC1 disease. Our prior studies also indicated that regulation of serotonin signaling or GLP1 receptor activity may improve mitochondrial burden in NPC1 disease. We sought to expand on these findings by developing new cellular models of NPC1 disease, including: endogenously EGFP- or mCherry-tagged NPC1 and isogenic NPC1 knockout lines with or without reporters. We chose to insert the coding DNA sequence for either EGFP or mCherry in the first coding exon, 3’ to the signal sequence. After cloning the left (LHA) and right (RHA) homology arms from genomic DNA surrounding the insertion site, we assembled a donor template with any of the following inserts between the LHA and RHA: (a) mCherry without stop codon; (b) mCherry with stop codon; (c) EGFP without stop codon; (d) EGFP with stop codon. The resulting donor templates produce either mCherry-NPC1 (a) or EGFP-NPC1 (c) fusion proteins or mCherry (b) or EGFP (d) transcriptional reporters without NPC1 gene function. All four sets are capable of functioning as fluorescent reporters of NPC1 gene expression, while only donors a and c are fusion proteins. 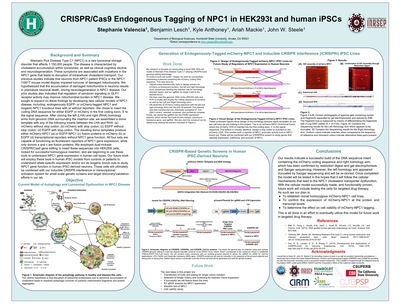 We employed dual-nickase CRISPR/Cas9 gene editing to insert these sequences into HEK293t cells, looked for successful homozygous insertion, and are beginning to use these tools to understand NPC1 gene expression in human cell types. Our future work will employ these tools in human iPSC models from controls or patients to understand allele-specific expression and/or act as isogenic knock outs to study NPC1 gene function in human iPSC-derived neurons. These cells will ultimately be combined with our inducible CRISPR interference or transcriptional activation system for small scale genetic screens and target discovery/validation efforts in our lab.